Sorry it has taken a minute to write this note, but we've all been very busy in the Kitchen. The JBJ Soul Kitchen officially opened its doors in Red Bank, NJ on October 19th. The response has been even better than we could have hoped for. 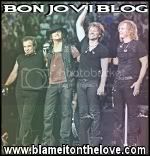 We at the JBJ Soul Kitchen are a Community Restaurant where there are no prices on our menus. As you may have heard you can either donate at least the minimum donation of $10.00 for your meal or donate your time to earn your meal. We have met many people from across the economic spectrum who are all ready, willing, and able to engage in our community. At a time when 1 in 5 families are living at or below the poverty line and 1 in 6 children in NJ are food insecure, this is a restaurant whose time has come. 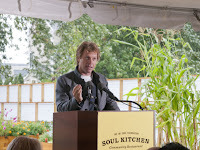 The JBJ Soul Kitchen is also a model that can be replicated in your town.I want to thank everyone who made this vision a reality, all of the staff, volunteers, contractors, those who have donated money, time and words of encouragement, those who have come to eat or just to check us out on the web.If you are in the Red Bank area, come down and check us out, lend a hand, make a friend or two, and by the way, eat!